As I mentioned in my previous blog I mentioned that I was going to do Taste & Create again this month. 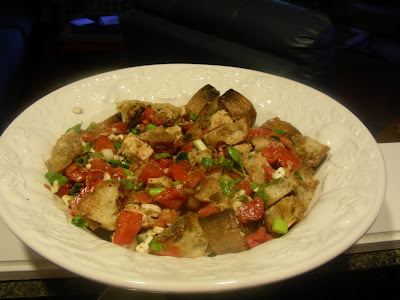 I was paired with Edana from Yum Food, so I decided to make Panzanella or Italian Bread Salad. I had always wanted to make it , but never had the chance, It is an earthy salad with layers of flavor from the basil, mint, cheese and the balsamic vinaigrette with stale bread, I used a rustic baguette from Trader Joe's. Then it had fresh tomatoes, a shallot, fresh mint, and basil, goat, feta, or ricotta salata cheese and a vinaigrette of oil and white vinegar, I used Balsamic vinegar.Also, instead of a shallot, I used green onions. Adding cooked chicken is optional, you can leave it as a vegetarian dish, so the recipe is very versatile. It is also very economical with few ingredients and quick to make. Leftovers, if you have any, may even better, because all of the flavors have a chance to mix, mingle, and intensify. It doesn't have a lot dressing, so the bread doesn't get soggy..I will make this again. Thank you Nicole for Taste and Create, and Edana for the recipe. It is easy to prepare with few ingredients, and has wonderful flavors! Super Sunday to you too.